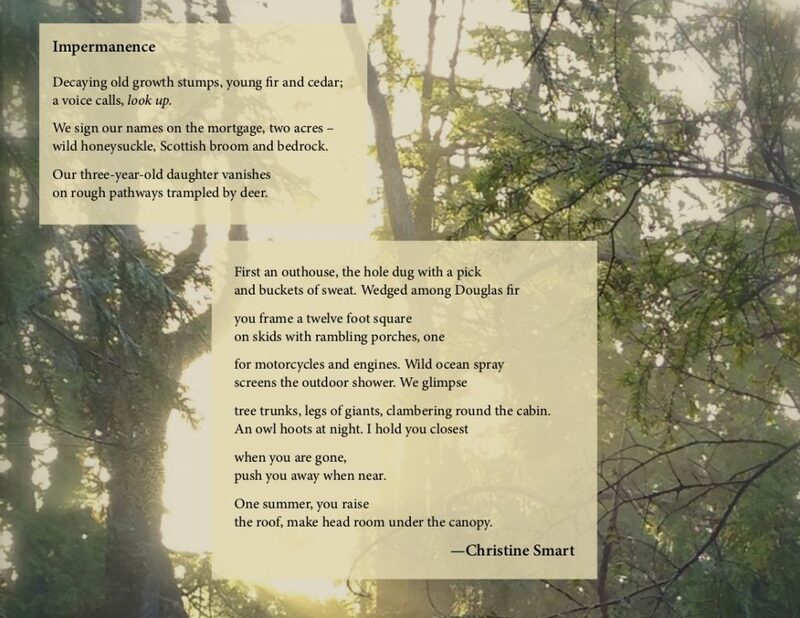 Contemplate Impermanence, and celebrate the 2019 theme of “nature,” with this evocative poem by Christine Smart of Salt Spring Island. Impermanence is reprinted here from Chris’s collection“decked and dancing” Hedgerow Press, 2006. Her second collection, “The White Crow” was also published by Hedgerow Press in 2013. You can find Christine’s poems in the periodicals Grain, CV2, Other Voices and Northlight Poetry Review, UK, as well as numerous anthologies. Wonderful poem Chris – loved it! Thanks for sharing!!! Oh this sounds like the home of my dreams, tucked among the forest, seaspray close at hand. Sigh. I loved this poem! While I read, I lived there, briefly. Thanks for your comment, Sherry. Thank you for your wonderful poem, Christine.